This was my fourth visit to Country's, the best known barbeque restaurant in Columbus, Georgia. The place is always packed, even on weeknights, and it's not hard to see why. Although the food wasn't quite as perfect as I had remembered, it was still delicious. Many meals come with barbequed onions which are unusually good. Also, if you like peanut butter pie, don't leave here without at least a piece to go. What really makes this place memorable though, is all the little touches from the butcher paper tablecloths (the kids can color on this table) to the nail aprons the waitresses wear to the Dale Earnhardt statue by the door. 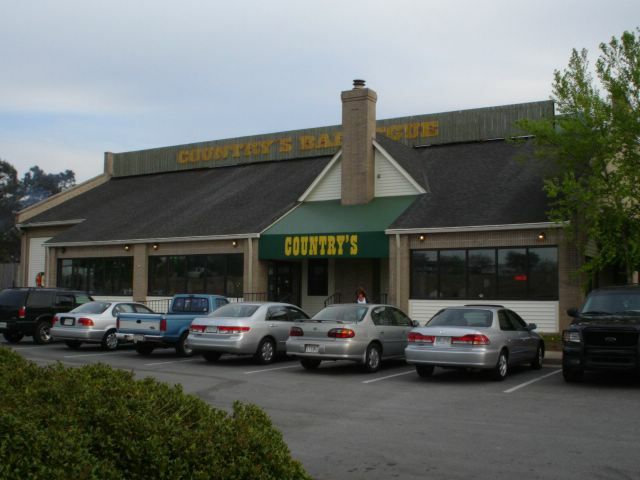 I highly reccomend Country's as a funky-country family friendly barbeque experience.